OVERVIEW Up until the treaty of September 1816, the land around Minor Hill belonged to the Chickasaw Indians. Some white men did move into the area before the Indian treaties were made only to have the soldiers come and destroy their crops, buildings, and drive them out of Indian Territory. Some settlers would return only to have the soldiers drive them out again. During the period of 1820 to 1860, Minor Hill and the surrounding communities were settled and the population grew. Joseph Minor and his family lived at the top of what is now "Minor Hill". Joseph and his sons owned about 450 acres on top of the hill. Circa 1857, the Minors sold their land to John B. Willams and left the territory. As John Williams sold parts of the land, it was called Minor land, giving the area the name of Minor Hill. Minor Hill had become a village by September 6, 1870, for the post office was established then. In 1900 the first gospel song book of James D. Vaughn's was published under the label "James D. Vaughn, Music Publisher, Minor Hill, Tennessee. Minor Hill has a special place in the history of the Civil War because of two important events that occurred in the community. Sam Davis, "The Boy Hero of the Confederacy" was captured in Minor Hill in 1863, and the Confederate Army fought its last battle in Tennessee at Sugar Creek in 1864.In the 1920's a monument at the site where Sam Davis was captured was built and dedicated by Governor Austin Peay. Today tourists enjoy visiting this historic site. 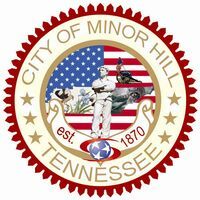 Today, Minor Hill is an incorporated city, with a mayor, four alderman, a city recorder, and two policeman. The population was 537 in the 2010 Census. Now Minor Hill has a post office, library, two convenience stores, a city hall with a police & fire department, a car wash, Minor Hill Utility District, Minor Hill Elementary School, a skate center, a park (which has a community building, horse show arena, playground, ball fields), a rodeo arena, several churches, and a couple of beauty salons. It is a thriving yet peaceful community with breathtaking views. MINOR HILL DURING THE CIVIL WAR During the period from 1820 to 1860 Minor Hill and the surrounding communities were settled and the population grew. 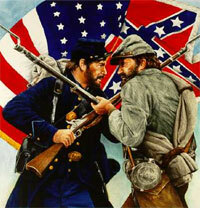 The period of progress came to an end with the outbreak of the Civil War in April 1861. During that summer, soldiers from the Minor Hill area made up part of the 1400 young men from Giles County that joined the Confederate forces. In March 1862, all of Giles County wasoccupied by the Union Army. This occupation continued until the end of the war in 1865, except for three short periods during which confederate forces invaded the county. The war and occupation had a disastrous effect on the entire county. Businesses were closed. Railroad tracks and bridges were destroyed by Confederate partisans to keep Union troops from using them. The county government went out of business. Throughout this time the Union Army got many of its supplies by foraging. Even though local farmers were sometimes paid for their crops, most Union Officers allowed their men to take what they wanted from the local people. Although few records have been found to tell us what happened in Minor Hill during the Union occupation, we can assume that the people suffered greatly. The Minor Hill Road was a key link in a series of roads that linked Nashville and Florence, Alabama. These roads were used throughout the war by both armies. It has been estimated that 250,000 soldiers either passed through or were stationed in Giles County during the war. Many of them came through Minor Hill and Anthony Hill. The destruction of homes, barns, crops, and livestock was great. Toward the end of the war, Union General George Thomas stated that the Minor Hill road passed "through a country devoid of subsistence for man or beast." Minor Hill does have a special place in the history Of the Civil War because of two important events that occured in the community. Sam Davis was captured in Minor Hill in 1863 and the Confederate Army fought its last battle in Tennessee at Sugar Creek in 1864. Sam Davis, "The Boy Hero of the Confederacy" was captured in Minor Hill on November 19, 1863. Davis, a 21 year old Confederate soldier from Smyrna, was a member of Coleman's scouts. Coleman's Scouts was the secret intelligence unit of the Army of Tennessee, which in 1863 was commanded by Gen. Braxton Bragg. In September 1863, the Army of Tennessee had defeated a large Army at the Battle of Chickamauga just south of Chattanooga. Bragg drove the Union troops into the city and laid siege to it. Bragg knew that massive Union reinforcements would be sent from the West to break the siege. He sent Coleman's scouts into Middle Tennessee to determine the number of troops moving toward Chattanooga. Among these scouts were Sam Davis, Joshua Brown, and Col. H. B. Shaw. Shaw was the commander of Coleman's scouts using the alias Captain Coleman. The scouts spent several days observing a large Union Army which moved from Cornith, Mississippi to Florence and then to Pulaski. They had counted the number of regiments and cannons. At first they had memorized the information to avoid being captured with incriminating documents. The volume of information, however, became so large that they had to write it. Sam Davis was given the task of carrying these papers as the scouts moved south toward the Confederate lines in Alabama. On November 18, 1863, they spent the night in the home of a Confederate sympathizer in Campbellsville. The next day they separated and moved south. Later that day, all three were captured by Union troops from Kansas. Shaw and Brown were captured oh Agnew Creek and Davis was captured in Minor Hill. They were taken to the Courthouse in Pulaski, where Gen. Granville Dodge had established his headquarters. Dodge was the commander of the Union Army moving through Giles County. The incriminating papers were found in Davis's boots and saddle. Dodge believing that Davis could not have collected as much information by himself without the help of other scouts or possibly a Union informer demanded that Davis reveal with, wham he was working. After long questioning Davis refused to reveal names. As a result he was court-martialed and sentenced to death as a spy. On several occasions, Gen. Dodge pleaded with Davis to reveal the names of those who worked with him. Dodge promised to spare Davis' life for this information. The young Confederate, however, steadfastly refused to reveal the names of his fellow scouts. On November 27, 1863, Sam Davis was taken to the gallows on East Hill. He was given one more chance to reveal the names of Shaw and Brown. Davis replied by saying, "No, I cannot. I would rather die a thousand deaths than betray a friend or be false to duty." Davis was hung. His bravery, dignity, and last words made him famous allover the country. He became known as the "Boy Hero of the Confederacy" and was admired by both northerners and southerners. In 1906, the United Daughters of the Confederacy erected a monument in Davis' memory on the south side of the Pulaski square. In the 1920's a monument at the site where Davis was captured was built and dedicated by Governor Austin Peay. In 1985, the Minor Hill post of the Veterans of Foreign Wars refurbished this monument. One year and one month after the capture and execution of Sam Davis the Confederate Army fought the last of many battles in Tennessee in the Minor Hill Community. The Union reinforcements that were moving toward Chattanooga that Davis scouted arrived helped the Union Army take the city on November 23, 1863. This Army was commanded by Gen. Ulysses S. Grant. After his victory at Chattanooga, Grant was called to Washington by President Lincoln and appointed General-in-Chief of all Union Armies. Grant appointed Gen. William T. Sherman as commander of the Army at Chattanooga. Sherman was given orders to take Atlanta and then move through Georgia and take Savannah. Sherman's army cut a 60 mile wide path of destruction through Georgia in order to destroy Confederate supplies and destroy the southern will to continue the war. Grant took personal command of the Union Army stationed around Washington and began a series of battles against Gen. Robert E. Lee and his Army of Northern Virginia. By the fall of 1864 Grant had surrounded Lee on the outskirts of Richmond, the Confederate capital. Sherman had taken Atlanta and was moving through southern Georgia. Confederate leaders were desperate. They realized that without some bold offensive that the war would be lost. To draw some of Sherman's troops out of Georgia and possibly some of Grant's from around Richmond, Gen. John B. Hood of Texas was given orders to take his army of 45,000 from northern Alabama through Middle Tennessee and attack Nashville. Some of this army moved through the Minor Hill area in early November 1864. On November 20, Hood's army fought and won a major battle at Franklin which enabled them to move within sight of the State Capitol in Nashville. On December 15 and 16 the Battle of Nashville was fought. The Union Army without the help of reinforcements from either Sherman or Grant routed the exhausted Confederates many of whom were without winter clothing or boots. To avoid his troops from being captured during the disorganized retreat toward Alabama, Gen. Hood put his Gen. Nathan Bedford Forrest in charge of fighting a rear guard action. Forrest, one of the best cavalry generals of the Civil War, delayed the pursuing Union Army at Columbia, Waco and Buford Station. Hood had time to reorganize his army and send it on an orderly retreat toward Alabama. On Christmas Day 1864, Hood's army passed through Pulaski and moved south down the Minor Hill Road. Later that day Forrest deployed his men and cannons on the rim of Anthony Hill. The advance units of the Union Army were pinned down by heavy fire at the foot of the hill. As the rest of the Union Army caught up, the road became blocked. The main Confederate Army was able to move through Minor Hill on Christmas afternoon. They made camp for night along Sugar Creek. After killing about 150 Union soldiers and losing 50 of his own Forrest retreated through Minor Hill and joined the main army in its camp. The next morning Forrest and his men fought the last major action on Tennessee soil. This battle took place on the hill between Sugar Creek and the Alabama state line. Forrest stationed his men and cannons along the blind curve in the road as it goes up the hill. The morning was very foggy. The Union advance guard marched around the curve straight into the Confederate line of fire, Forrest described the scene with these words, "The enemy, therefore, advanced to within 50 paces when a volley was opened upon him causing the wildest confusion." After this volley, Forrest ordered his men to charge the confused enemy. The Union troops began fleeing back to Minor Hill. Forrest counted about 150 dead enemy soldiers on the field at Sugar Creek. Two hours later Forrest led most of his men across the state line toward the Tennessee River. Hood's force had crossed the river earlier in the day. A small force was left at Sugar Creek. Since there was no attempt by the Union to renew the attack, this group crossed the Alabama line about four o'clock. This was the end to all major fighting in Tennessee. The Confederate attempt to draw Union troops to Nashville failed. The war ended four months later. Anthony Hill and Minor Hill had become battle sites in the bloodiest war ever fought by Americans.